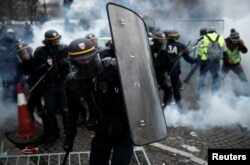 France has suspended planned increases in fuel taxes for six months after violent protests in the streets of Paris and other cities. Prime Minister Édouard Philippe announced the delay of the tax increases in a speech on national television. “No tax is worth putting the nation’s unity in danger,” he said. Fuel taxes had been set to rise on January 1. Philippe said the increase would go into effect six months later. He also announced that electricity and natural gas prices will not increase before May 2019. President Emanuel Macron announced the tax increases last month. French officials said they are designed to move the country away from fossil fuels and part of an effort to fight climate change. 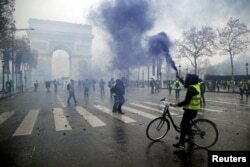 Protesters wearing yellow vests, a symbol of a French drivers' protest against higher fuel prices, clash with riot police on the Champs-Elysee in Paris, Nov. 24, 2018. The demonstrations started on November 17 in Paris. Protesters wore yellow traffic vests that French drivers are required to carry in their vehicles. Since then, the “yellow vest” protests have developed into a movement against Macron. Protests last Saturday caused heavy property damage in Paris and other French cities. Police used tear gas to control crowds. In the capital, more than 100 people were injured and more than 400 arrested. Macron is a 40-year-old former investment banker and economy minister. He has promised to reform France’s economy and increase economic growth. The most violent protests took place last weekend while Macron attended the G-20 (Group of 20) meetings in Buenos Aires, Argentina. The demonstrations took place as France joins other countries at the United Nations Climate Change Conference in Katowice, Poland. Macron has been a supporter of the 2015 Paris Agreement on climate change. The tax increase has been described as an effort to move France further to renewable energy sources. It is unclear whether the government’s latest moves will put an end to the protests. Macron has said he will “never accept violence.” However, reports say he has urged Philippe to ease tensions and meet with protest groups. The movement does not seem to be led by a known labor leader or opposition politician. That, observers say, makes it more difficult for government officials to answer. Mario Ritter adapted stories from VOA News and Reuters for this VOA Learning English report. George Grow was the editor.